Turkey's war on Afrin is an attack not only on Kurdish self-determination, but on democracy and women's liberation in the Middle East. According to a World Health Organization report, eighty-six civilians — including a whole family of seven — have been killed, along with two hundred wounded. More than ten thousand fled due to the bombings in one week. Kurdish sources such as the Administration of Afrin Canton Council and the head of the Afrin hospital however say the number is even higher. Turkish attacks in Afrin, which have also struck ancient sites, explicitly breach international law. Yet since the beginning of the first attacks on January 20, no outrage against this military aggression has been vocalized by a government or the international community. “Kurds have no friends but the mountains” has become an easy refrain over the years to respond to the injustices the Kurdish people have been subjected to. But, after more than a century of atrocities, the Afrin assault still feels particular and urgent, an opportunity for meaningful solidarity before all democratic accomplishments in Northern Syria are destroyed by Turkey, her jihadist foot-soldiers, and the imperial powers. The Afrin crisis has emerged as an epitome of the region’s predicament and raises three fundamental questions: What is Turkey’s role in the historical oppression of Kurds in the region? Who today challenges them as the defenders of Afrin? And what are the geopolitics of the conflict? Whenever the Turkish government launches an “operation,” especially an “anti-terror operation,” you can be certain that Kurds will be the first ones in the crosshairs. After the June 2015 elections, when Erdoğan’s Justice and Development Party (AKP) lost the majority it needed to form a government on its own, snap elections were announced for November 1. In the meantime, the peace process with the Kurdistan Workers’ Party (PKK) was terminated and a state of emergency declared in the country’s Kurdish southeast. The government, hand in hand with the military, launched so-called “cleansing operations” against supposed PKK members and targeted strongholds of the People’s Democratic Party (HDP), a left-wing alliance with its roots in Kurdish politics and effectively the only challenger of the AKP, in an act of collective punishment. A sizeable death toll and significant displacements were the consequence. About this time two years ago, on February 5, the AKP government revealed a ten-step action plan to “repair” southeastern Turkey, which had been destroyed in the wake of the siege (or, as then-Prime Minister Ahmet Davutoglu would have it, was “traumatized by terrorists who started the fire”). This post-operation “master plan” included consultations with village guards that function as pro-government militia and the construction of bulletproof security towers in urban districts. It was, in reality, just another phase of the warfare, an attempt at tearing local residents from their historically inhabited spaces and creating obedience. But it also had an economic purpose: the further the dependency of the region. By offering compensation, building mass residencies in the outskirts of the cities, offering loans at a reduced rate and new employment opportunities to displaced residents, the Turkish state hoped to create a new relationship between impoverished Kurds and the Turkish state. These meager economic measures, it was hoped, would win public support while the ongoing systematic criminalization of the HDP continued. Just another chapter in a long story of social engineering practices carried out to achieve assimilationist political gains. The main pillar of Turkey’s Kurdish policy has traditionally been the forceful integration and homogenization of dissident regions into a common cultural stream by invading communally important spaces, deconstructing them, and creating new, controlled ones in their place. This was the case after the Dersim massacre in 1938, which followed a Kurdish uprising against state repression, when the remaining Kurdish population was forcefully redistributed to non-Kurdish cities by the Turkish state. And it continued in the 1990s, when the Turkish military burned down four thousand Kurdish villages and intentionally caused the displacement of the huge proportions of the rural population of the Southeast to urban locations. The Turkish state has decades of experience trying to domesticate those who resist aggressive Turkification policies. “One nation, one state, one flag, one language” has been its motto, a refrain which defines Kurdish culture as outside the boundaries of Turkishness. In practice this means Kurdish lives being sacrificed for the sake of preserving the Turkish nation state. But Kurds in Turkey have mounted considerable resistance to this process since the foundation of the Turkish nation state — be it in form of regional rebellions in the early years of the republic, attempts at participating in civil politics after the introduction of the multi-party system, or with the formation of an armed liberation movement, the PKK. Finally, the emergence of the HDP, an umbrella for anti-establishment left-wing parties and organizations with a focus on women’s liberation and the Kurdish question, marked a significant shift in combating state-led Kurdophobia in Turkey. Not only was 2015 a year where the HDP’s vision of a radically democratized Turkey found an electorate and denied Erdoğan the absolute majority he needed for his attempts to establish authoritarianism through constitutional amendments. But also, on the other side of the Syrian-Turkish border, the resistance of Kobanê against the darkness of the so-called Islamic State (IS) echoed across the world. This resistance explicitly exposed the foreign policy of the Erdoğan government, forcing its alliance with jihadist militias to become public. While the international community was expecting Turkey to take an active role in providing a humanitarian corridor and facilitating the transport of ammunition and weapons to Kobanê, the Turkish government set conditions for their support instead: the Kurds should join the Syrian-Arab opposition; the Democratic Union Party (PYD), the political arm of the YPG/J, should distance itself from the PKK; the three cantons of Rojava should disintegrate; and finally, a buffer zone should be established in northern Syria, which would mean a de facto Turkish occupation of Rojava. This was a textbook example of how domestic politics can be translated into geopolitics. While the nationalist state doctrine in Turkey denies any form of Kurdish self-determination inside Turkey, including the right for education in mother tongue, any sort of Kurdish autonomy outside Turkish borders is also perceived as an immediate threat to the state integrity and combated. “Today or tomorrow,” Erdoğan pronounced, “Kobane will fall.” This pattern continued when the Kurdistan Democratic Party in South Kurdistan/Northern Iraq held a referendum for independence in 2017. Against the expectations of the Kurdish leaders of the party, the Turkish government cooperated with Iraqi prime minister Haider al-Abadi and the theocratic regime in Iran against Kurdish aspirations of national independence from Iraq. The project defended by the Democratic Federation of Northern Syria/Rojava is fundamentally different — proposing a more radical social structure and a more just regional settlement — and has thus been under more severe siege since the beginning of the Syrian crisis in 2012. 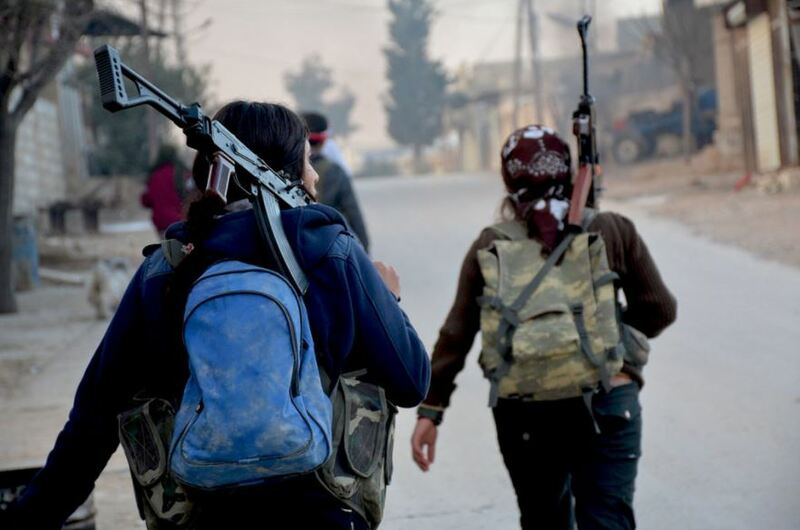 Until the strategic defeat of the so-called Islamic State in Raqqa in October 2017 Turkey’s involvement in Northern Syria/Rojava was by proxy and predominantly in form of an ideological and logistical haven for IS militants. It was only recently, when the Turkish army attacked Afrin, that it entered the Syrian conflict as an explicit and active aggressor against the Democratic Federation of North Syria/Rojava. Turkey now openly cooperates with jihadist groups with their roots in Al-Qaeda such as Faylaq al-Sham, Jaish al-Nasr, Jabhat al-Shamiya, Ahrar al-Sham, Suqour al-Jaber, the Sultan Murad Brigade, and the Nureddin Zengi Brigade which made headlines in the West when they decapitated a twelve year-old boy with a knife in July 2016. In line with its domestic practices of ethnic-social engineering over a century of Turkish history, President Erdoğan and his advisers have repeatedly said that the area around Afrin should be “cleaned” and returned to its “real owners.” Considering that Kurds have historically been the indigenous and dominant ethnic group of Afrin, the question remains who those “real owners” will be. Alarming signs include enforced Arabization and ethnic cleansing. Recent bombings of the Hittie temple complex in Ain Dar also point in the same direction. They amount to attempts to eradicate historic sites of religious plurality and cultural diversity in the region, an act reminiscent of the practices of the Taliban in Afghanistan or Islamic State in Syria. A striking photograph from one of the many funeral ceremonies in Afrin since the beginning of the attacks showed twelve coffins next to each other, surrounded by a huge crowd. On each coffin there was a flag with a different emblem representing a group within the Kurdish-led Syrian Democratic Forces. This image illustrated the tragic face of what the Rojava resistance represents: unity in diversity. While Turkey aims to extinguish plurality, the Kurds in Syria have built a system that is fundamentally based on the principle of co-existence and equal participation. In the midst of the Syrian war and in the fifth year of the Rojavan resistance, the Democratic Federation Northern Syria-Rojava was officially declared. Thirty-one parties and two hundred delegates gathered in a constituent assembly, representing the three self-administrated cantons of Cizire, Kobane, and Afrin. They were joined by representatives of the Arab, Assyrian, Syriac, Armenian, Turkmen, and Chechen peoples of the regions of Gire Spi/Tal Abyad, Shaddadi, Aleppo, and Shehba. After the two-day meeting, a declaration was made that expressed the Rojavan and Northern Syrian people’s will to not engage in the establishment of national independence in the classical sense. The declaration proposed a federative system as part of the wider conflict resolution. Grassroots democracy, women’s liberation, and a full representation of all groups in society organized in a council system were determined as the constitutive principles of the new social contract. In September 2017 the first federal elections were held in the Democratic Federation Northern Syria-Rojava, with co-chairs of 3,700 communes across the three cantons being elected, followed by local councils in November and an assembly in January. Grassroots democracy was developed out of the ashes of war. This radical democratic experiment has its roots in the ideology of the PKK and the concept of democratic confederalism put forward by Abdullah Öcalan, the founder and leader of the Kurdish movement, who has been on a prison island in Turkey since 1999. Inspired to a degree by Murray Bookchin’s libertarian municipalism, democratic confederalism is about achieving a new ethos of citizenship and community in transforming and democratizing city governments, by rooting them in popular assemblies in order to then weave them together into a confederation consisting not of nation-states but municipalities. Afrin for the Kurds, therefore, is not only a region that is under attack, but stands symbolically for the possibility of indigenous autonomy beyond the establishment of another nation state. It also stands in practice for the achievements of women. Women who fought against IS not only for a national interest, as mostly portrayed, but against patriarchal oppression that was incarnated in its most violent form by IS. By equally partaking in the liberation of Rojava, women-only battalions, the YPJ, fought for their place in a free society. The Kurdish freedom movement has had a relationship with imperialist powers over the past three years in Syria. Close cooperation took place on the battlefield against IS on various occasions. There are still joint coordination centers for air attacks with Russia in the Canton of Afrin, and also in areas around Deir ez-Zor. The tactical cooperation with the United States is even closer. The Syrian Democratic Forces, a coalition of various combat groups with the YPG and YPJ being a sort of vanguard unit, have been armed by the United States and accompanied in battle by American special commandos. They also have their own military bases and air fields in the Canton of Cizire. The anti-IS coalition accompanied the liberation of Tabqa, Raqqa, and parts of Deir ez-Zor with massive air strikes. Prior to Turkish military involvement in Afrin, the United States had announced its intention to set up a thirty-thousand-unit border guard force with the SDF. To Turkey, this was an immediate threat, a Kurdish-led army on its borders. This is despite the fact that those Kurdish-led forces have not posed an actual threat to the Turkish state since the beginning of the Syrian civil war. While the Kurdish freedom movement has seen the relationship as tactical rather than strategic, they have often been decried as “ideological partners” and “ground troops of the West” in their fight against the Islamic State. Now, when these powers and Russia are allowing Turkish attacks in Afrin, supported by jihadist mercenaries, patronizing voices within the ranks of the international left say “We told you so!” and accuse the Kurds of being imperialist collaborators. But you cannot understand the conflict without distinguishing between long-term political strategy and short-term military tactics. Strategically, neither of the two major powers has had any influence on the political project of the Democratic Federation of Northern Syria-Rojava to date. The social and political upheavals are progressing without top-down imperialist design. Altun emphasized that there can be no joint political project for the future with the United States or Russia. According to Altun, the United States has always tried to blackmail the Kurds in northern Syria, aiming to convince them of the need for a Kurdish nation-state, despite the fact Rojava is built on foundations that oppose nation-statism. Neither the divisive interests of the United States, nor Russia’s ambitions for a strong central state under the hegemony of Assad, have been scenarios for the Kurdish freedom movement to consider as real solutions to the prevailing predicament. In the words of Erdal Firaz, an activist of the Kurdish freedom movement in Germany: “In essence, an inextricable contradiction remains and since we were never friends, there can also be no betrayal.” When Raqqa, the last logistic stronghold and capital of the IS, was liberated by the Kurdish-led SDF with American assistance in October 2017, the women and men of the SDF held a liberation ceremony in the city center with a huge print of Abdullah Öcalan. This was a symbolic act to show the world, and particular their tactical allies, that the Democratic Federation Northern Syria-Rojava would stay true to its principles and its political project despite geopolitical games at play. Rojava has remained politically independent and this creates discomfort for the imperialist superpowers. This has been the leading motivation for permitting Turkey’s attack. Russia and Damascus have no long-term interest in a Turkish occupation of Afrin, especially because this attack is partly carried out by jihadist proxy mercenaries. But the ferocious campaign against the Kurds could, they hope, drive the SDF into the arms of Russia and force them to make political concessions to Assad. Russia, if it wanted, could close the airspace over Afrin to Turkish war planes, hence ceasing the arbitrary bombing of civilian neighborhoods. This reality was made evident when senior Kurdish official Aldar Xelil declared, just prior to Turkey’s attack, that Russia asked the administration of Afrin to hand over the territory to the Syrian government in order to close Afrin’s airspace. Surrendering territories that are historically Kurdish and have been defended by the YPG, YPJ, and SDF since the beginning of the Syrian war was not even considered as an option. Taming Rojava’s political project in the interests of imperialism is not something the Kurdish movement is prepared to countenance. Turkey’s attack in Afrin resonates in Idlib, since Moscow gave a green light for it to progress in exchange for Turkey withdrawing her jihadist allies from the region. With the beginning of the Afrin offensive, massive bombardments of northern parts of Idlib by Russian and Syrian war planes have left significant casualties. A massive ground offensive has already occupied strategically important points in the Idlib area, officially marked as a “de-escalation zone.” Clearly what’s happening in Idlib is the other side of the attack on Afrin. Russia and Syria are not only responsible for war crimes in Idlib but also complicit in Turkey’s war of ethnic cleansing in Afrin. Russia was also prepared to authorize Turkey’s military intervention because there is a Russian-Western competition for good relations with Turkey. Russia has an interest in breaking Turkey out of the Western bloc, and in the long term, placing it in its sphere of interest. Western countries want to keep Turkey a member of the NATO family, hence its strategic rapprochement with Russia, which Erdoğan repeatedly references, does not sit well with the United States. In January 2018, Erdoğan and French president Macron signed a preliminary agreement on the cooperation of the French-Italian weapon consortium Eurosam with the Turkish arms manufacturers Roketsan and Aselsan. Prior concessions were made for this deal already in September 2017, when Turkey released French journalist Loup Burea from prison. In addition, the Turkish Air Force has more than sixty “Mangusta” battle helicopters from Italian production in its arsenal, one of the reasons for the great joy at Erdoğan’s presence in Italy and the Vatican earlier this month. The Kurds deserve more than the friendship of their mountains, they deserve the solidarity of the international left, because not only is their existence and identity in danger but so too are the hopes of radical democracy and women’s liberation in the Middle East. Inside and outside Rojava, defending Afrin must become our imperative. Rosa Burç is a research associate at the Institute for Political Science and Sociology of the University of Bonn, where she teaches radical democracy, nationalism, and Turkish-Kurdish politics. Kerem Schamberger is a research associate at the Institute for Communication Science and Media Research of the Ludwig Maximilian University of Munich and a member of the Marxist Left.